inspires employees by amazing → opportunities and customers by exciting products. Company’s vision must both be driven by (Yin) and drive (Yang) the aspirations of its customers. If you are truly → passionate about your work, everything around you becomes your inspiring coach. Love breeds Love. Love what you do and success will fall in love with you. 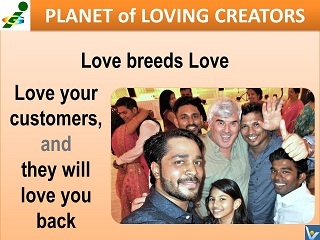 → Love your customers and they will love you back. Great business is a daring vision of a → passionate and creative victor, not a blueprint by a consultant. Don't be a Chief Executive Officer, be a Chief Inspiration Officer! There are only two competitive strategies in the modern economy driven by relentless innovation: disrupt of be disrupted. → Surprise to win ‐ excite your employees, amaze your customers, shock your competitors! 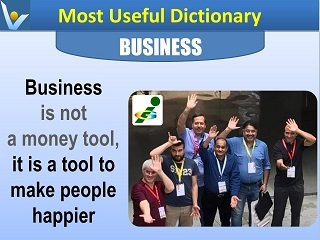 → Great businesses do take care of their → revenue stream but focus on passionate creation of increasingly great value for today's stakeholders and tomorrow's → learners. → problem solvers create best under the gun. → Market Leaders create best for fun under the gun. Master of Business Administration? 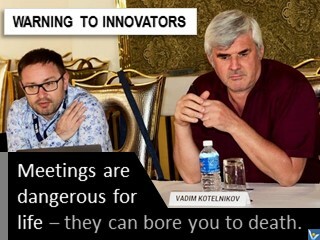 In today's rapidly changing economy administration would rather kill an → innovative company. To be successful you must be an → innovative, dynamic and flexible Master of Business Synergies! Development must be → balanced, like Yin and Yang: some people focus on creating breakthroughs (Yang), others ‒ on preserving established values (Yin) on the way. Innovation is 1% of invention and 99% of entrepreneurial → action. Managers succeed by following the rules. 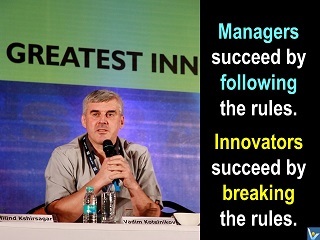 Innovators succeed by breaking the rules. In radical innovation, every step forward is a step into terra incognita where opportunities are guides and failures are teachers. When you create radical innovations, entrepreneurial simulation games work far better than classic business planning, strategy formulation and project management methods. 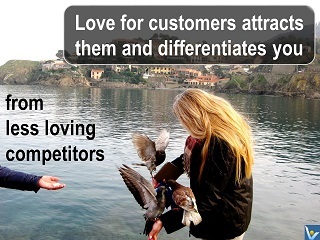 and differentiates you from the less loving competitors. If you sell something non-innovative, work hard to make prospective customers notice you in the crowd of other sellers. If you created radically new customer value, create also an emotional buzz marketing strategy to make people desire your product. Things get easier when you take a helicopter view ‒ you can see and be seen far better. Smart people and firms recognize change. Smarter people and firms anticipate change. Smartest people and firms create change. 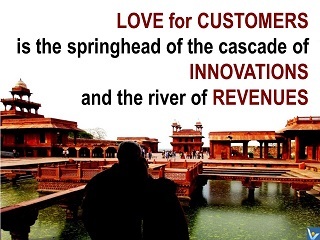 Passion for customers is the first step – in the right direction! – in achieving your business goals. 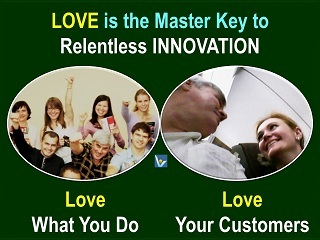 Every company that wants to be successful must start with establishing the culture of → love for customers. The rest will follow. 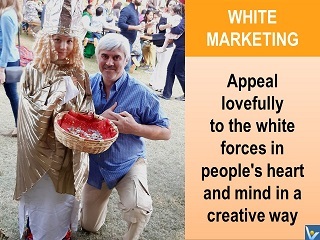 To me, marketing is about appealing to the white forces in people's heart and mind in a creative way ‒ as soon as I can distinguish between white and dark fighters in my own heart and mind. Fortunately, they are easy to distinguish: the white fighters are those who are driven by unconditional love towards others. Don't sell products, help your customers succeed and thrive. 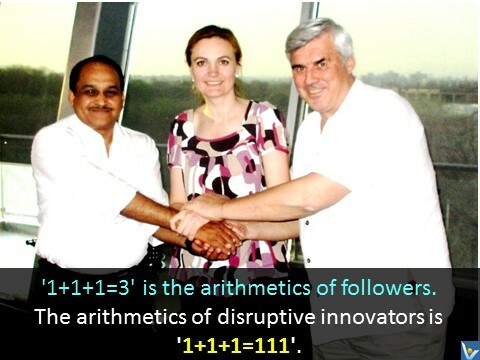 '1+1=2' is the arithmetics of followers. Understand that change in never over. See your organization as a winning team of rafters that strives to win a race in white waters of a rough river. Embark on your brave 'Change Management' boat and ride the waves of change that come relentlessly from different directions in different forms.